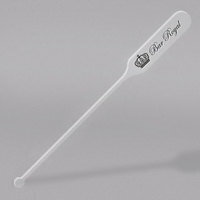 We offer coffee straws in short and long styles, and we have the stirrers to suit any type of cup or glass. Some of these straws even come with a convenient stirrer paddle on the end. Our selection of plastic stirrers comes in many colors that attract customer attention, and we also carry natural wood coffee stirrers. Choose from opened straws for quick service or individually wrapped straws for additional sanitation depending on your preferences. Also make sure to check out other great items from Choice, EcoChoice, Royal Paper and WNA Comet. We carry bulk packaged and individually wrapped wood or plastic coffee straws and coffee stirrers. Ideal for hot beverages like coffee, tea, and hot chocolate, we've got the perfect type of straw or stirrer for your restaurant, café, break room, or bar. Keep coffee straws on hand behind your counter, in your drink preparation area, or give them to servers to bring to customers' tables. For more items to accommodate your coffee preparation needs, check out our coffee makers, paper hot cups, and our sugar packets and creamers. If you're wondering where to buy wna comet coffee stirrers and coffee straws, we have a large selection of wna comet coffee stirrers and coffee straws for sale at the lowest prices.